A few years ago, there was a story doing the rounds about a wife whose husband had been cheating on her. When she found out, she packed her bags but before walking out, removed several of the light switch covers, placed sardines from a can into each of them and refitted the covers using No More Nails. It was quite a while before the husband figured out where the unpleasant fishy smell was coming from. But whether the story is true or not, we actually had a call out to a fishy smell in a Lambeth Kitchen. The householder had noticed that there was an unpleasant fishy smell for a while after having used the electric oven. She was aware that this can be caused when certain plastics become hot, for example the hard plastics used for switches and socket covers. Using our testing equipment and the information we were given, we traced the fault to a poorly connected wire behind the cooker isolation switch. Poor connections have a higher resistance and a higher resistance means more heat is generated. In this case, the wire significantly overheated when the oven was in operation, damaging both the guts of the isolation switch and the cable insulation. The switch was changed and the cabling was also replaced back to the consumer unit. Whilst on the subject of Lambeth kitchen electrics, in nearby Southwark, we visited a client who was also having issues with their kitchen electrical system (fridge-freezer tripping) and who was also having a new AGA two oven range installing. The first part of the job was to install the AGA, which was fairly straightforward. AGA demand that their products are installed by an approved installer who needs to use a qualified electrician. We arrived at the arranged time to find the installer was running a few minutes behind but that was no great problem as we like to do a job properly and always test any existing cooker circuits prior to connection. In this case, although the electrics had been installed a while ago, they were fine and the isolation switch was in a suitable place too so it was just a case of making the right connections. Next was to inspect the other installation to solve the problem of the circuit with the fridge-freezer repeatedly tripping the RCD. Since a tripping RCD indicates an earth leakage problem, we first checked the circuit to the CU which was fine so we turned our attention to the appliance. To cut a long story short, the problem wasn’t actually electrical. The reason that there was an earth leakage fault was that the defrost water drip tray on the top of the compressor was overflowing and so water was reaching the compressor motor terminals. We could have stopped there but we do like to go the extra mile for clients. Asking ourselves why should this be overflowing led us to spot that the evaporator was becoming very heavily frosted and during the defrost part of the cycle, it was producing an abnormally high quantity of water – too much for the drip tray. Over-frosting in a fridge usually occurs because of a faulty door seal, so the ultimate fix was left to the fridge repair man. 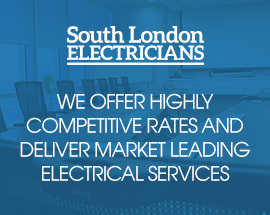 If you are having a kitchen refurbishment in Lambeth, or need a cooker installing correctly in your Southwark kitchen, contact South London Electricians on 020 3199 9093 for a no-obligation chat.